This is Missouri hybridizer Dave Niswonger's H. 'Gasping for Breath' blooming in my Illinois garden. <posted December 18, 2014> Are your tastes in daylilies rooted or related to the moment you fell in love with daylilies in general? I definitely think mine are. I gravitate toward full-petaled, polychrome or monochrome daylilies with heavy substance. Those are my first choice if someone would ask what my taste in daylilies is. I think I feel that way because the first hybrid daylilies that turned on the daylily light bulb for me had those characteristics. 25 years into this addiction, those types of daylilies still make my green heart sing. Apply that theory to books. If you are an avid reader, you have a genre that you really enjoy. Maybe its a guilty pleasure like romance or adventure, but whatever it is, it is likely so because when you first started to love reading, you read books in that genre whether by convenience, availability or recommendation of your parents/teachers/mentors. I think the same can be applied to daylilies. Your heart remembers the first time you fell in love and it will seek out that feeling at every opportunity. My first purchased hybrid daylilies included H. 'Golden Scroll,' H. 'Tani' and H. 'By Myself,' shown below blooming in my Illinois garden in 2014. I still have the same plant I bought decades ago. The name H. 'By Myself' appealed to me and the time in my life when I bought it. I was going through some early-20's angst when daylilies appeared in my life, so the names played a big part into their interpretation in my garden. Not much has changed in my current garden. The names are smoke signals to another time and place, and sometimes my heart aches to return there when I see them in the garden. Its all good stuff - even if the memories aren't always happy ones. It was also introduced the year I was born, which was a novel connection to me as a novice collector. As I peeled the onion of this hobby more deeply, I learned that H. 'By Myself' was hybridized by Dr. Virginia Peck, a lady who has an entire chapter dedicated to her in A Passion for Daylilies. 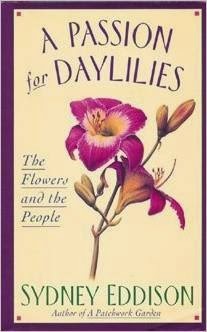 This book is an absolute must-read for everyone who loves the people who love daylilies. And it is an awesome travesty that its available used on Amazon for $0.63 plus shipping. You should go buy 5 copies and gift them to your most rabid daylily friends. Right now. Click on the book picture below to do it. You're welcome. Reading about her attendance at the now-famous 1961 AHS National Convention where the Chicago powerhouse hybridizers were presenting their first strong findings on conversions. (Bless the hearts of those modern braggadocios who think they are the pioneers on conversions. That was over 50 years ago, friends.) Van Sellers, recent Stout Silver Medal Winner, defines Dr. Virginia Peck as "not only the first, but THE major contributor to the tetraploid gene pool and the front-runner in every color." That is so huge. Most people don't know that the tetraploid revolution began in the Chicago-area, let alone one of its early champions was a woman. Its. Just. Cool. Stuff. She died in 1990, a few years before I would buy my first hybrid daylilies, and 20 years after her introduction of H. 'By Myself.' They called her a super mom of daylilies; a lady with a doctorate and a tiny, weather-worn face. My favorite quote of hers shared in the book is, "I found out I couldn't do everything." Amen, sister. The more I learn about the people who came before me in this community, the more I love both the flower and the people. I often think, If I wrote a book like Sydney Eddison's today, what does someone 30 years in the AHS of the future need to know about the people in today's daylily community? What are we doing as a human collective that benchmarks OUR time in the daylily world? What does the table of contents of THAT book look like? Those are deep thoughts to consider over a fire and some egg nog this holiday season, and Id love to hear what you came up with. Please share! Interesting Video - anyone know the author? An old post of mine I thought I would dust off. My daily breakfast-blog :-) Wonderful!